Sometimes things get tough and difficult to bear, making it difficult to keep on working on them, towards original goal, towards dreams, to finish what one started. If you have ever started something, something serious and worth doing, and if you have made a promised you intend to keep and things get really tough, really unbearable, then you, like me, have thought about quitting, have had to content with the urge to quit. Pastors have abandoned their churches, spouses their marriages, dreamers their dreams, employees their jobs, businesspeople their businesses, when the going got tough, when things were not working out, YET. Faced with pain and death Jesus had to deal with the urge to quit. ‘May this cup be taken from me’, He said. ‘May you allow me to quit avoid pain that’s awaiting me and abandon the plans’ (my translation). So what do you do when the task is so overwhelming and your strength cannot match it? What do you do when the original passion you had for what you do had disappeared? What do you do when the reasons to quit are so much stronger than the reason to keep at it, reason to keep holding on? What do you do when you keep on failing with each attempt you make? This is what I know: Failure is keeping on doing what doesn’t work longer than it is necessary. It is also giving up on what you need/want too early. Success is a balance and knowing the difference between these two. We have to submit ourselves to the will of God no matter our urge to quit, just like Jesus did. Quitting was not an option for Jesus, and I’m glad he did not. Jesus understood that in order to be fit for service, He couldn’t look back. If He needed to defeat the devil unto eternity, He had to first defeat His urge to quit and submit to the Will (and purpose) of the Father. The purpose sometimes is the only thing that keeps us going, during the rough patch. Sometimes, knowing that every season passes is enough consolation we need to hold on. 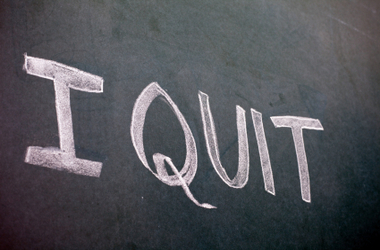 Sometimes quitting can do more permanent harm than the temporary reprieve we might get from it. We need strength from God to be able to complete any task He has put in front on us. We need to hope in the Lord so we don’t grow weary nor faint. We cannot live as per His Will without Him. There are rewards though for those who continue to do good even in the face of difficulty, those who defeat their urge to quit. May we wait until the proper time so we could harvest the seed we have planted. May we press forward and win the prize no matter the difficulty. We we have the strength to continue doing what we need to do no matter the circumstances. May we abide by the will of God and do what we need to do each day. May we not give in to the urge to quit on things that really matter to us and to God. In Jesus’ name, Amen. Whatever God ordains, He sustains.